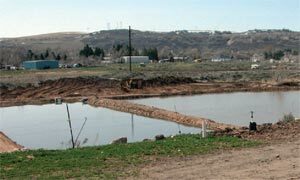 Two of the four shallow infiltration ponds at Ogden-area aquifer storage and recovery project site. The pilot project for the Ogden area aquifer storage and recovery project described in the August 2003 issue of Survey Notes is well underway. 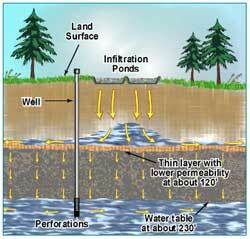 Aquifer storage and recovery projects involve the storage of water in an aquifer via artificial ground-water recharge when water is available, and recovery of the stored water from the aquifer when water is needed. 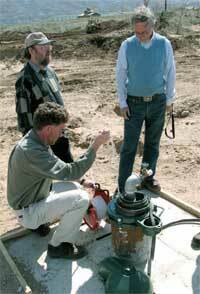 Pre-experiment work included establishing a monitoring well at the site, measuring water levels in the monitoring well and other nearby wells, analyzing water quality from nearby wells and the Weber River, and performing microgravity surveys. 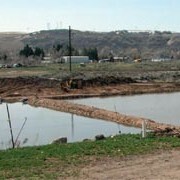 In March 2004, water from the Weber River was diverted into four shallow infiltration ponds on coarse-grained river deposits at the pilot-project site. The 1- to 2-foot-deep ponds have a total area of about 3.7 acres. When the diversion of water from the Weber River was completed in July 2004, the aquifer beneath the project site had received about 800 acre-feet of ground-water recharge, resulting in a water-level rise of about one foot in the monitoring well at the site. A low-permeability layer (a sediment layer that allows water to move through it less readily than adjacent layers) about 120 feet below the land surface at the project site caused the infiltrating ground water to spread laterally, resulting in lower waterlevel increases at the monitoring well than were anticipated prior to the experiment. During the same time period, water levels in other nearby wells declined 4 to 10 feet; this indicates water levels at the monitoring well would have actually declined at least a few feet in the absence of the recharge experiment, so the net waterlevel rise at the monitoring well was at least 4 feet. Microgravity surveys conducted before, during, and after the time of infiltration clearly show the building, migration, and dispersal of the newly created ground-water mound below and adjacent to the recharge ponds. Microgravity has proven to be an invaluable tool to monitor the subsurface movement of ground water infiltrated from the recharge ponds, given the insufficient number of suitable monitoring wells adjacent to the recharge site. A digital ground-water flow model is currently being constructed to improve our understanding of the aquifer system and the effects of the ground-water recharge experiment. Post-experiment water-level, waterquality, and microgravity data will continue to be collected until May 2005. Although the recharge rate at the pilot-project site is lower than anticipated, the project has been enough of a success that the Weber Basin Water Conservancy District has purchased the site property, and plans are being considered for implementing aquifer storage and recovery at the site on a permanent basis beginning next spring. The preliminary results of this pilot project, combined with recharge experiments conducted near the mouth of Weber Canyon in the 1950s, indicate a strong likelihood for the success of similar aquifer storage and recovery projects in the greater east shore area of Great Salt Lake, where ground-water levels have declined up to 50 feet since the late 1930s. Active gravel pits in the area may be potential sites for future infiltration ponds when the gravel resources become depleted. This project highlights the ability of many entities to successfully work toward a common goal. Project participants include the Weber Basin Water Conservancy District, U.S. Bureau of Reclamation, Weber State University Department of Geosciences, University of Utah Department of Geology and Geophysics, Utah Division of Water Resources, and Utah Geological Survey. Additional information regarding the Ogden-area pilot project is at http://weberbasin.com/aquifer.